Cameroon’s Francophone (French-speaking) President Paul Biya is the favorite to win reelection as president on Sunday. A poll reveals that none of the nine opposition candidates would be able to defeat Biya, even though the economy is tanking, and most voters are opposed to Biya's war and atrocities on the Anglophone (English-speaking) population in the Southern Cameroons region of the county. The atrocities began in November 2016, when the Francophone (French-speaking) Cameroon government security forces began beating and killing peaceful anti-government demonstrators in the South Cameroons, the Anglophone (English-speaking) regions of Cameroon. The demonstrators were protesting systematic bias, discrimination and marginalization towards Anglophones by the Francophone government. For example, schoolteachers in the Anglophone regions were forbidden from teaching any courses in English. Court cases had to be held in French, and it was against the law to provide English translations of the laws. The Anglophones began forming their own army called the Ambazonia Defense Forces (ADF), with about 1,500 people spread around 20 camps in the Anglophone regions. 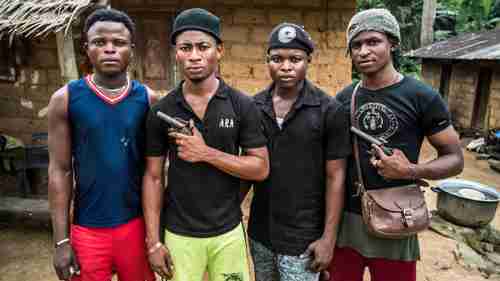 In most cases, the people are farmers who had been forced to leave their villages, armed with hunting rifles that are made in Nigeria. In September of last year, activist separatists began using small bombs to target local security forces. "I learned with emotion of the murder of four Cameroonian soldiers and two policemen in the south-west of our country. I think that things are now clear to everyone. Cameroon is the victim of repeated attacks by a band of terrorists claiming to be part of a secessionist movement. "found that both government forces and armed separatists have abused civilians in the western part of the country, displacing over 180,000 people since December 2017. Anglophone separatists have extorted, kidnapped and killed civilians, and prevented children from going to school. In response to protests and violence by armed separatists, government forces have killed civilians, used excessive force against demonstrators, tortured and mistreated suspected separatists and detainees, and burned hundreds of homes in several villages." According to claims by the separatists, within the last month the Francophone army has been burning down villages, and killing anyone from 13 years to 50 years old. Cameroon's Francophone government has declared a 48-hour curfew in the Southern Cameroons region, occupied by the Anglophones. October 1 is the first anniversary of the day when tens of thousands of demonstrators took to the streets, triggering an army massacre that killed hundreds of people.